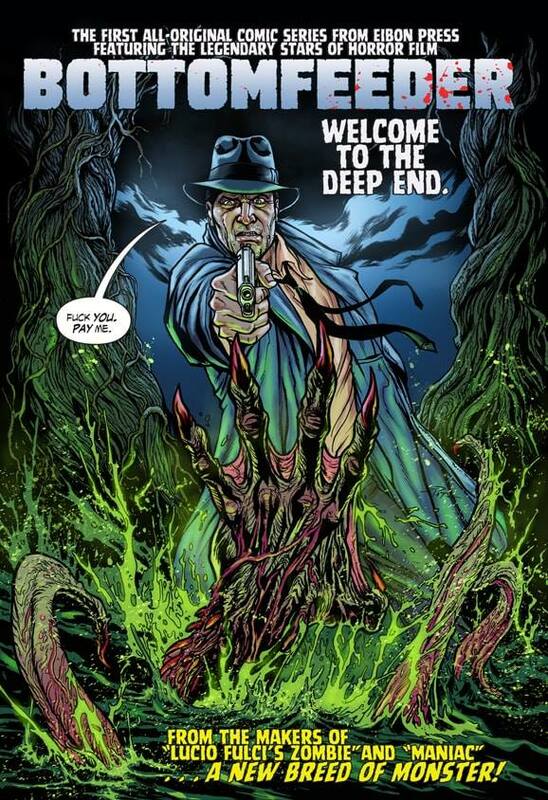 Bottomfeeder is “Bad Lieutenant meets Humanoids from the Deep”; this qoute, from series creator Shawn Lewis, is the most accurate way to describe the gitty new comic from his horror comic company Eibon Press. Bottomfeeder tells the tale of a bad cop, Joe Angell, his dirty dealings and the trouble a monster made from illegally dumped chemicals can cause, namely death. Obviously, I’ve been singing praises about Eibon Press all year (including my end of the year list) but Bottomfeeder marks the start of something a bit new for them, an entirely original property. According to the man himself, like many good things, Bottomfeeder came to life one night over some drinks, a wild idea to fuse two distinctly different types of films. Initially conceived as a movie, Bottomfeeder would go through a tumultuous creation process that saw never saw the movie get off the ground but would eventually lead to the production of this comic book. One thing that did stay consistent with the movie they proposed all those years ago is that it would star none other than Joe Pilato, most famously known for portraying the loudmouth military commander Rhodes in Day of the Dead. 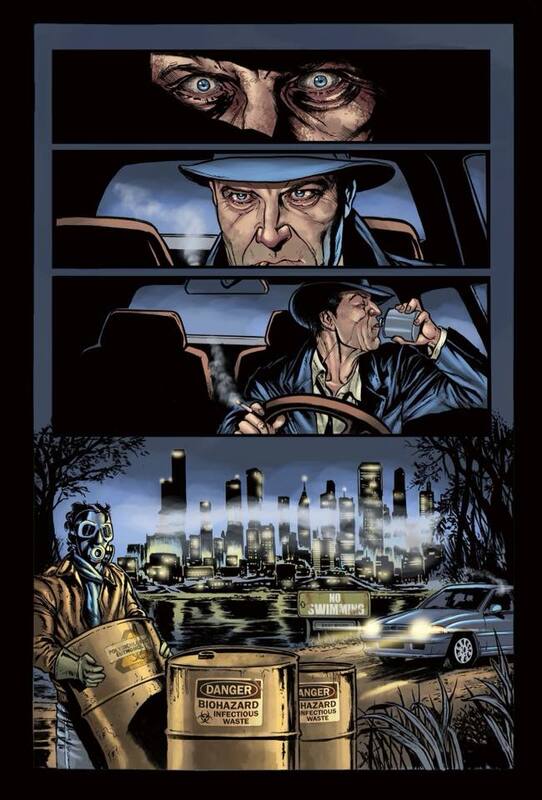 “Casting” real world actors is something Eibon Press has been doing for most of their comics, using the likenesses and performances of actual genre actors in their comics and I think think it adds another layer of participation to the story. The art is to the same high standard that all of their previous releases have held, with regular artist Pat Carbajal returning and Javi Laparra on interior colours while Fatboy handles colours on the stunning cover art. The art here is just as gory and visceral as previous releases (well, maybe not Maniac but that comic is over the top in a special way), so the squeamish need not apply. It isn’t like they try to hide it either; Bottomfeeder wears it’s sleaze right there proudly on the front cover, the image of a woman being violated in the most Japanese of styles with some tentacles front and centre once you pop the comic out of the sleeve. The extra stuff that comes in the sleeve this time around is your pretty basic package for Eibon Press – some stickers, bookmarks, posters that will make people look at your sideways. All the good stuff. This issue also comes with a download card that lets you hear Joe Pilato spit the very lines of his character in Bottomfeeder, as if you couldn’t already hear his distinct bark in your head when you read those words. Now I just want to hear a audio drama style version of Bottomfeeder, seeing as those are all the rage now with the kids. Then I could have Joe Pilato yelling in my ear about slave labour Nike shoes every week and who the hell doesn’t want that? Bottomfeeder fuses Abel Ferrera and Roger Corman into a unique and gory vision that might not be for everyone, but the people who do get it will love it. If you think you’re one of those people, grab a copy of Bottomfeeder here from Eibon Press and follow them on facebook, twitter and instagram.